Disney Skyliner will begin transporting guests in Fall 2019, announced Bob Chapek, Chairman of Disney Parks, Experiences, and Consumer Products. The new gondola system will connect Disney’s Hollywood Studios and Epcot to four resort hotels: Disney’s Art of Animation Resort, Disney’s Pop Century Resort, Disney’s Caribbean Beach Resort, and the proposed 15th Disney Vacation Club property, Disney’s Riviera Resort. Construction on the Disney Skyliner is moving right along at Walt Disney World. Recently, workers installed the last support tower and they’re beginning to thread the reinforced cables that will carry the gondolas across the resort. Disney shared new details on the upcoming Disney Skyliner transportation system as part of their 12 Days of Disney Parks Christmas extravaganza. 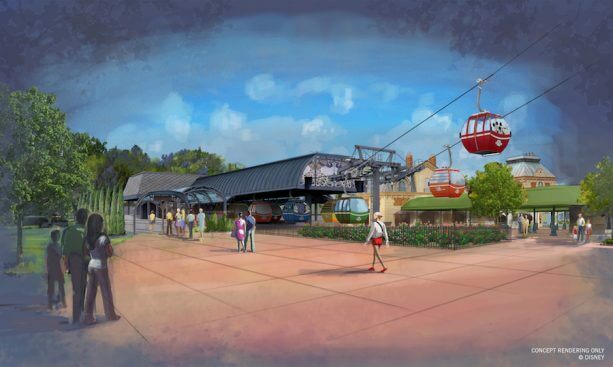 The Disney Skyliner, announced earlier this year, will give guests unforgettable views as they travel between select Disney resorts, Epcot, and Disney’s Hollywood Studios. 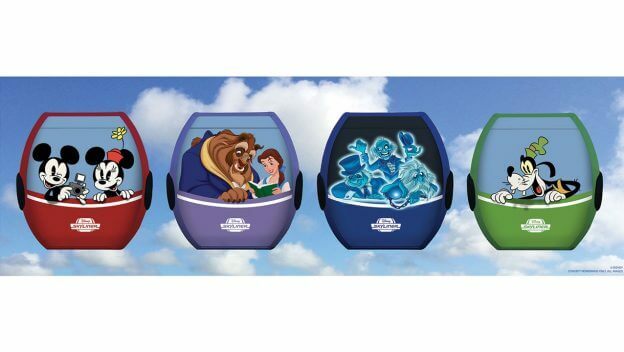 Select Skyliner cabins have iconic Disney characters incorporated into their exterior design, making it seem like Disney pals are riding along with you. Characters will include favorites from the “Fab Five,” Disney attractions, movies, and more. The Disney Skyliner station at Epcot’s International Gateway is inspired by the park’s European Pavilions. The station is covered in metal and glass canopies, hand-painted murals, and ornamental steel structures in early 18th-century Art Nouveau style. Guests traveling to Epcot on the Disney Skyliner can enjoy a rare birds-eye view of World Showcase. 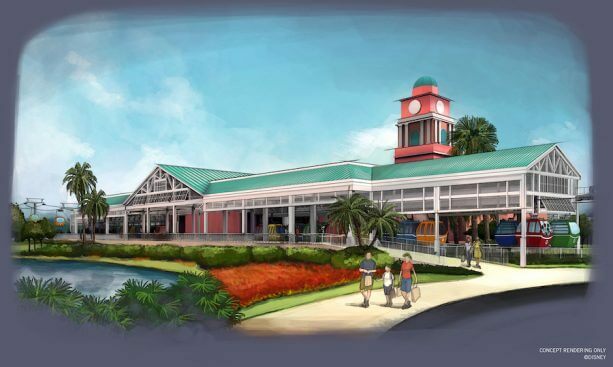 At Disney’s Caribbean Beach Resort, the Disney Skyliner station is inspired by the open-air marketplaces of the islands and showcases the nearby resort’s color schemes and architecture. Passengers can use this station to transfer gondola routes to their final destination or just sit and admire the resort’s waterfront setting. 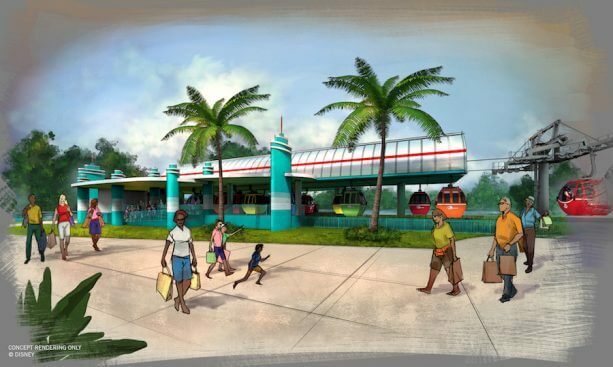 The station at Disney’s Hollywood Studios matches the style of the park’s main entrance and bus stations. Passengers traveling between Disney’s Caribbean Beach Resort and Disney’s Hollywood Studios can enjoy new aerial views of the park’s iconic attractions, such as The Twilight Zone Tower of Terror. Disney’s Pop Century Resort and Disney’s Art of Animation Resort will share a whimsical station that fits in with the decor of both hotels. When passengers depart this station, they ascend over Hourglass Lake for a panoramic view of each colorful resort. In addition, curious guests can get a close-up view of the Disney Skyliner’s mechanical and aerial components when cabins slow down at the turn-station along Buena Vista Drive. I am trying to read all the skyliner info, however I cannot find out when this will be completed.